Here's a technical look at how to trade some of the biggest stocks on Wall Street right now. BALTIMORE (Stockpickr) -- "Nothing to see here, folks!" That's the message Mr. Market was shouting to investors yesterday, as the big S&P 500 index climbed nearly 0.9% higher just ahead of the hotly anticipated Fed rate comments scheduled for this afternoon. Yesterday's move puts the S&P's rebound at 6.8% from its lows back at the end of August. The fact that many investors seem ready to jump in here says a lot about the strength of this market right now. While volatility may be moving higher as we head into the final stretch of 2015, it's a mistake to forget the fact that we're still in a bull market that's been going for seven years and change now. Barring a colossal crash in stock prices this fall, we've got to look at August's drop in the context of just another correction. And so, while the big breakout buying signals have been a little bit fewer and further between in recent weeks, the opportunities are still there for investors in September. 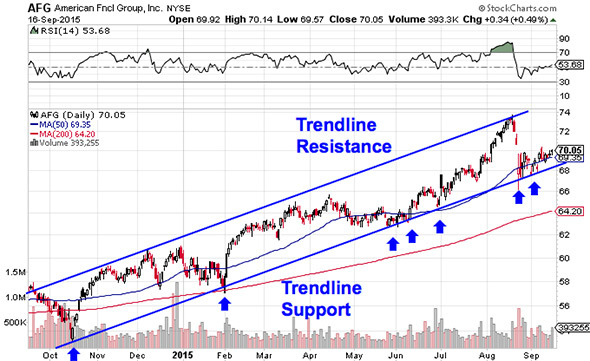 Today, we're turning to the charts for a technical look at five big-name stocks to trade for gains. First, a little on the technical toolbox we're using here: Technical analysis is a study of the market itself. Since the market is ultimately the only mechanism that determines a stock's price, technical analysis is a valuable tool even in the roughest of trading conditions. Technical charts are used every day by proprietary trading floors, Wall Street's biggest financial firms, and individual investors to get an edge on the market. And research shows that skilled technical traders can bank gains as much as 90% of the time. Housing stocks have been one major pocket of strength lately -- and $11.5 billion homebuilder D.R. Horton (DHI - Get Report) has been no exception. Since January, D.R. Horton has rallied nearly 25%, leaving the rest of the market in its dust. But don't worry if you've missed the move so far; this stock looks ready to kick off a second leg higher in September. D.R. Horton is currently forming an ascending triangle pattern, a bullish price setup that's formed by horizontal resistance up above shares at $32, and uptrending support to the downside. Basically, as shares of D.R. Horton bounce in between that pair of technically significant price levels, this stock has been getting squeezed closer and closer to a breakout about our $32 price ceiling. When that happens, we've got our buy signal. Relative strength (not to be confused with RSI at the top of the chart) adds some extra confidence to the upside in D.R. Horton right now. That's because relative strength is holding its uptrend from the start of the year, indicating that this stock is still outperforming the rest of the market long-term. As long as that uptrend in our side-indicator stays intact, D.R. Horton should keep on outperforming the rest of the market. Mid-cap food distributor Pinnacle Foods (PF is showing traders the same setup right now. Like D.R. Horton, Pinnacle has been forming an ascending triangle pattern for the last few months, edging closer to a breakout as we head towards the fall. 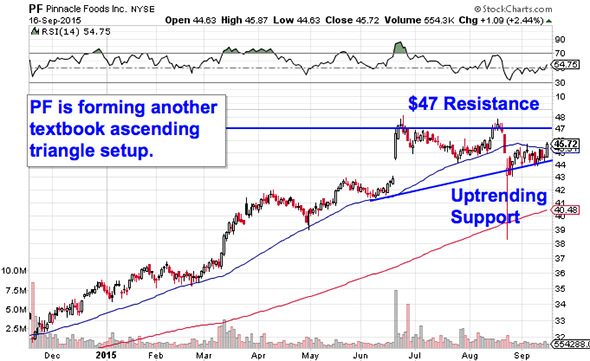 $47 is the big breakout level to watch in this food stock. If shares can shove their way above $47, then it's time to be a buyer. Why all of that significance at that $47 level? It all comes down to buyers and sellers. Price patterns, such as this ascending triangle pattern in Pinnacle, are a good quick way to identify what's going on in the price action, but they're not the actual reason a stock is tradable. Instead, the "why" comes down to basic supply and demand for Pinnacle's shares. The $47 resistance level is a price where there has been an excess of supply of shares; in other words, it's a spot where sellers have previously been more eager to step in and take gains than buyers have been to buy. That's what makes a breakout above $47 so significant -- the move means that buyers are finally strong enough to absorb all of the excess supply above that price level. Remember to be reactionary with this trade; it's not a high-probability buy until the breakout actually confirms our buying pressure. BP (BP - Get Report) is having a tough run in 2015, much like most of its peers in the energy sector. Since shares peaked back in May, this $95 billion oil and gas company has seen its shares lose about a quarter of their market value. But after a long-term selloff, BP is starting to look "bottomy" this fall. BP is currently forming a double bottom pattern, a bullish reversal setup that looks just like it sounds. The double bottom in BP is formed by a pair of swing lows that bottom out at approximately the same level; the buy signal comes on a breakout through the peak that separates those two troughs. 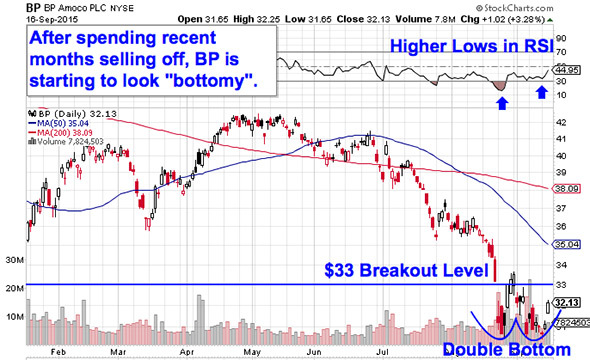 For BP, that breakout price is $33. Momentum, measured by 14-day RSI, is the secondary indicator for the BP trade. Our momentum gauge made higher lows at the same time BP's price chart was re-testing support – that's a bullish divergence that indicates buying pressure is building under the surface. If increasingly eager buyers bust shares through $33, it's finally time to join the long side of this energy stock. Good news: You don't need to be an expert technical trader to figure out what's been going on in the price action in insurer American Financial Group (AFG - Get Report) in 2015. Instead, the price action is about as simple as it gets. AFG has been a "buy the dips" stock for the last year now, and as shares dip for the seventh time here, it's starting to look like another buying opportunity again. AFG has been moving higher in a well-defined uptrending channel since last fall, bouncing in between trendline support down at the bottom of the channel and a resistance line to the topside. Now, AFG is coming up off the bottom of its channel this week – that makes now a good opportunity to buy the next bounce. Waiting for that bounce is important for two key reasons: It's the spot where shares have the most room to move up before they hit resistance, and it's the spot where the risk is the least (because shares have the least room to move lower before the channel breaks, and you know you're wrong). Remember, all trend lines do eventually break, but by actually waiting for a bounce to happen first, you're ensuring AFG can actually still catch a bid along that line before you put your money on shares. Last up on our list of breakout stocks is grocery chain Kroger (KR - Get Report) , a stock that also happened to make our cut of Rocket Stocks this week for unrelated reasons. Now, Kroger's also looking solid long-term from a technical standpoint. While most of the market corrected hard back in August, Kroger has held up well, keeping its trend sideways and its price within grabbing distance of prior highs at $39. From here, that $39 level is a spot traders should be keeping a close eye on. The sideways price action in Kroger is a long-term rectangle pattern. It gets its name because the pattern basically "boxes in" shares between horizontal support and resistance lines. For Kroger, the levels to watch are resistance up at $39 and support at $34. 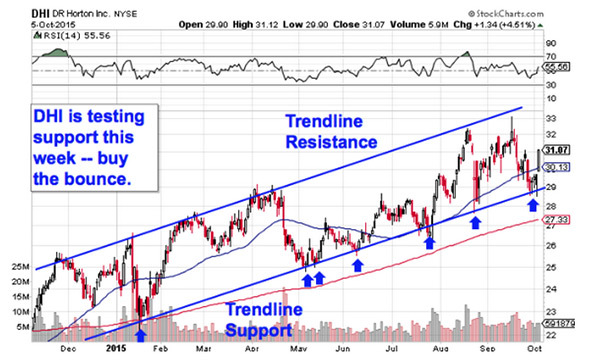 Rectangles are "if/then patterns: If Kroger breaks out through resistance at $39, then traders have a buy signal. Otherwise, if this stock violates support at $34, then the high-probability trade is a sell. 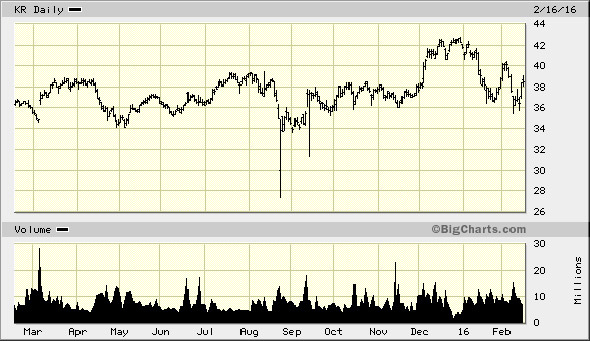 Because Kroger's prior trend was up at the start of 2015, it favors breaking out above $39. Still, like with any breakout setup on this list, it's important to be reactionary and wait for Kroger to exit the rectangle before you take sides on this trade. Technical analysis is a risk management tool, not a crystal ball, and this doesn't become a high-probability buy until our price ceiling gets taken out.